After many hours of research, I have finally finished putting together a selection of the 6 best instant cameras from among the 23 devices currently available on the market. I have always dreamt about taking beautiful instant photos and I have finally found the ideal camera for doing so: the Instax Square SQ10 – the perfect compromise between digital and film photography. At the end of this article, you will find a buyer’s guide that should help you choose the perfect instant camera for immortalizing any moment! Although cameras can often be breathtakingly expensive, I was able to find two instant cameras that retail for a reasonable price. The fact that I have chosen to begin this comparison by discussing a Polaroid camera shouldn’t come as a surprise to anyone familiar with instant photography. Polaroid was once THE brand of choice for all things instant photography. But is that still the case? Does the brand live up to its reputation? 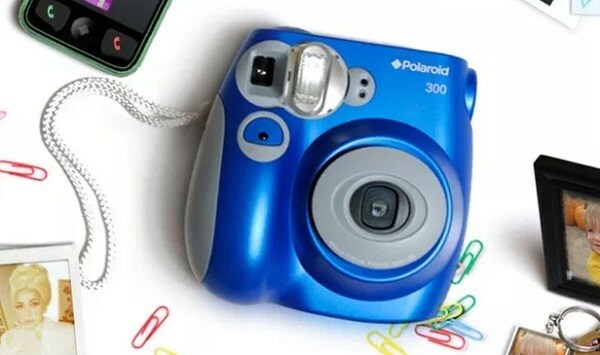 The Polaroid Pic-300 is an updated version of the “classic” Polaroid camera and has a very modern-looking design. Its rounded shape gives it a very pleasant appearance and it is compact enough to be easily carried around. Measuring only 12.2 x11.9 cm, it is much smaller and more lightweight than older generations of Polaroid cameras – a real advantage (especially when it comes to transporting it in a bag/case). The Pic-300 caters to all kinds of different tastes and is available in a number of “non-standard” colors schemes (electric blue with touches of gray-blue and bright red or soft violet with a hint of white)! One thing is for sure, this camera will not go unnoticed! And, if you worry about losing your camera, you won’t have to with the Pic-300 since it comes with a wrist strap. Aesthetics are important but what really counts in a camera is its performance. What I really like is that this camera has an autofocus as well as an automatic flash that activates when the ambient light level is too low. These two features really make a photographer’s life easier, especially at a party! The Pic-300 produces instant color photos that are around the size of a business card (4.57×6.09 cm); these prints are smaller than traditional Polaroid pictures but are still quite enjoyable to look at and are more versatile in some respects. Personally, I find this photo size to be ideal for creating small montages, however, that’s just my opinion. The Pic-300’s photos, which begin to develop immediately after they are printed, are of quite good quality. According to several users, the Pic-300’s photos are very sharp in addition to having good color rendition and a very pleasant film grain. As an added bonus, the Pic-300 also features 4 shooting modes! The Pic-300 uses relatively expensive photo paper (and none of this paper is supplied with the camera)! Fortunately, it is compatible with Fujifilm’s Instax photo paper (which is less expensive than Polaroid 300 paper). The Pic-300 is not equipped with a mirror for taking selfies, which is a shame. While the lack of a selfie mirror may discourage some people from purchasing this otherwise beautiful and high-quality camera, the Pic-300 remains a good choice due to its affordable price and the good quality of its photos. Kodak is a well-known brand, especially in the world of photography. This manufacturer had given up on developing new cameras after its defeat in its legal battle with Polaroid. However, Kodak has not completely abandoned the photography industry and is still a world leader in the manufacturing of photo paper! 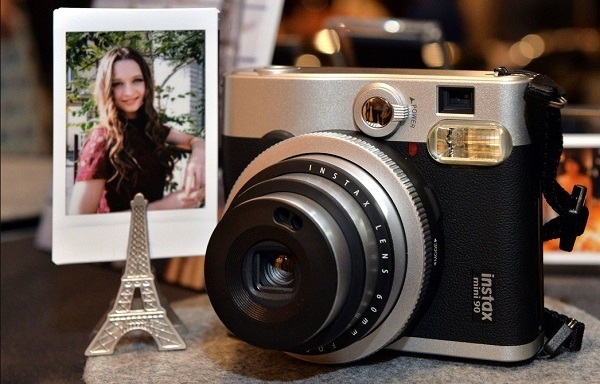 As it turns out, Kodak has decided to reenter the camera market by developing its own instant camera – the Printomatic! The Printomatic’s simple rectangular design is highly refined and highly stylized. Its shutter, which is surrounded by bands of color, is located in the center of the camera. While the Printomatic’s design is not unique (it resembles the Polaroid Snap), it is, nonetheless, quite aesthetically pleasing! In terms of its available color schemes, this camera has many to choose from, ranging from very bright colors such as cyan blue, pale pink, apple green, and canary yellow to more discrete black or gray. While I love the originality of the Pic-300’s shape, I love the Printomatic’s color schemes which really emphasize the simplicity of its design! Contrary to the Pic-300, Kodak’s Printomatic uses a rechargeable battery, providing you with all the comfort modern technology has to offer while you take vintage style photos! The Printomatic allows its users to take photos in black and white and has no difficulty alternating between b&w and color shots – contrary to the Pic-300, which has some difficulty in doing so… What I find nice about this camera is its fast speed; the Printomatic allows you to continue shooting even while it is printing previously taken photos! The Printomatic’s photos are similar in size to those of the Pic-300 – 5×7.6 cm (this photo format can seem a little small since it is so stretched out). However, the Printomatic’s photos are printed on Kodak’s Zink paper which features an adhesive backing and which is resistant to water, tearing and smearing! I am a big fan of “sticker” photography since this type of photo can be used to decorate a room, to personalize objects or for any other type of artistic project! The Printomatic comes with 10 adhesive photo sheets, which should be enough to get you started. If you are interested in giving this camera as a gift, the Printomatic can be purchased in a gift pack which includes the camera itself, 20 sheets of Zink photo paper, a Deluxe case, 7 sheets full of fun stickers, double-sided markers, a photo album, adhesive frames as well as a comfortable neck strap. Basically everything you could possibly need! Another nice feature is the narrow slit that allows you to attach a string or a wrist strap to the camera, greatly enhancing its ease of use and portability. Furthermore, the Printomatic will inform you when it is running low on power, storage memory or printer paper. In summary, the Kodak Printomatic is a good camera that uses high-quality photo paper and retails for a reasonable price. It is a great choice for instant photography fans despite its lack of a mirror for taking selfies! In this section, we will be discussing higher-quality instant cameras with a larger photo format. Instax WIDE 300: for taking XL photos! As a manufacturer of high-quality photographic equipment, Fujifilm needs no introduction. Its cameras are among the best in the world and its photo paper rivals that manufactured by Kodak in terms of quality. In this section, I will be discussing the first of the Fujifilm cameras I have decided to include in this selection: the Instax Wide 300 – one of the best large-format instant cameras on the market. The Fujifilm Instax Wide 300 is clearly not a pocket-sized Polaroid camera. It measures 18 cm (wide) x 12 cm (high) x 9 cm (thick) and weighs in at 780 grams. However, it is capable of taking large-format photos, which can be great for capturing landscapes or special events (birthdays, marriages, etc.). The Instax Wide 300’s outward appearance is rather conventional and serious-looking; it has an almost vintage look. At first glance, this Fujifilm camera looks very high-class, but upon closer examination, you will notice that its case is really constructed from plastic designed to give the illusion of metal. While this may make the Instax Wide 300 feel a little cheap, the plastic used in its construction is, nonetheless, of very good quality! I really like this camera’s “grip” (which resembles that of a reflex camera) and the fact that it can be mounted on a tripod. At any rate, the Instax Wide’s excellent photo quality makes up any of its shortcomings! Perfect focus is easily achieved by adjusting the ring around the camera’s lens; its shutter is triggered via the button located on top of the camera’s power switch. Its built-in electronic flash automatically adjusts itself in function of the camera’s distance from a subject (the flash can be deactivated) and the Instax Wide’s “fill-in” mode will allow you to take photos even in dark places! You can also play around with different lighting effects by using this camera’s “high-key” and “low-key” settings which are somewhat basic, but still quite interesting. The Instax Wide 300 also comes with a close-up lens which will allow you to focus at distances as close as 40-50 cm away from your subject! Some people have complained about this camera’s viewfinder being too narrow and too dark, but everyone agrees that it is very accurate. It’s a shame that this Fujifilm camera is not equipped with a self-timer. You will need to rely on the kindness of a passing stranger if you want to appear in your picture of a landscape… or on one of your friends if you are taking a group photo. The downside of the Instax Wide 300 is that it runs on batteries (LR6). Depending on how often you use this camera’s flash, you will be able to take between 100 to 150 photos before having to replace its batteries (which is not very practical especially if you are a real shutterbug!). In short, the Fujifilm Instax Wide 300 is a good camera; however, while it is solid, it is also rather bulky. It would be a good choice if your main interest is taking large-sized instant photos! 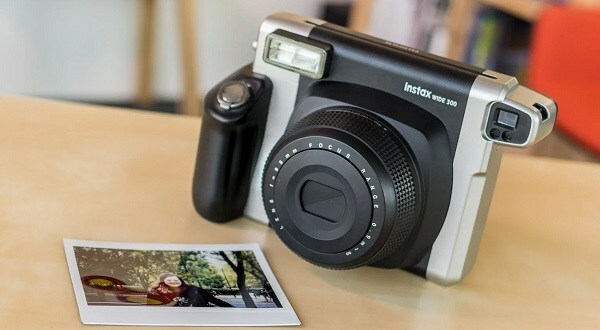 Fujifilm’s Instax mini 90 “Neo Classic”, as its name would suggest, is a small and rather conventional looking instant camera which is clearly geared towards a male audience. Its highly refined design is quite attractive and its imitation metal and leather case is rather aesthetically pleasing. As far as its dimensions are concerned, everything about this camera is truly “mini”, from its size (9.17×5.72×11.43 cm) to its weight (295 grams). 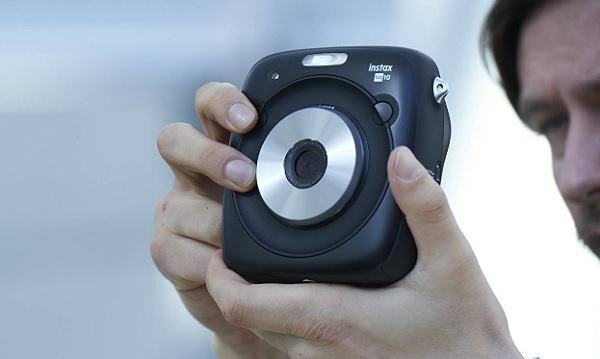 The Instax mini’s small dimensions make it very easy to hold and very easy to use for taking either horizontal or vertical shots (thanks to its two shutter release buttons). As an added bonus, and contrary to other instant cameras, the Instax mini 90 is powered by a rechargeable battery (which is more practical and eco-friendly)! What I really like about this Fujifilm camera is its advanced features (such as its long exposure and double exposure modes) which resemble those found on traditional analog film cameras. These features are great for exploring your creative potential! What’s more, the Instax mini incorporates a brand new macro mode as well as a high-performance flash (which can be deactivated), making it well suited to many different kinds of instant photography! This Fujifilm camera is also capable of measuring ambient light levels and can automatically adjust its shutter speed and the intensity of its flash in order to produce very high-quality photos. I really enjoyed this camera’s various shooting modes which resemble those found on digital cameras. These modes make it possible to adapt the mini 90 to a wide variety of different situations: its party mode allows it to capture a subject along with its background in perfect focus even in low light conditions. Its kids mode is well-suited to capturing fast-moving subjects, while Its landscape mode can be used for photographing a subject that is more than 3 meters away. The mini 90 also features a long exposure mode, a double exposure mode as well as a macro mode (for taking close-up shots). It is more than advisable to use a tripod when shooting in double exposure or long exposure mode. The mini 90 can easily be mounted on a tripod by means of the adapter located on the bottom of the camera. While this camera excels in terms of the quality of its photos, its main shortcoming is the small size of its photos (around the size of a business card) which, nevertheless, still remain clearly visible. Basically, the Instax mini 90 is a beautifully designed, multifunctional instant camera capable of taking high-quality photos. It is elegant, powerful, and versatile. What more could anyone ask for? In this section, we will be discussing two of the very best instant cameras available on the market. The first high-end camera we will be discussing is also the last Fujifilm camera of our top 6 selection. The Instax Square SQ10 distinguishes itself from the other cameras in its same product line by its very square design as well as by its “hybrid” nature. By this, I am referring to the fact that the SQ10 is a half-digital, half-film camera. Let’s begin by discussing this camera’s design. Contrary to its predecessors, the Instax Square has adopted a square photo format (which had previously only been reserved for The Impossible Project’s cameras). This square format is very popular among younger users in part because it is the format used by social media platforms. Despite being square in shape, the SQ10 still has the rounded design characteristic of other Fujifilm instant cameras. The Instax Square is rather thin-profiled and compact in addition to being surprisingly lightweight. While this camera can be used with a wrist strap, personally, I feel that doing so takes something away from its charm…but that’s just my opinion. Despite its numerous features, this camera remains very easy to use thanks to its well-organized and intuitive menus. The SQ10’s power switch is located next to its lens, on either side of which can be found a shutter release button (making this camera well-suited to both right and left-handed users – a shortcut key can be assigned to the shutter release button not being used)! The Instax Square’s hybrid nature has several clear advantages: it will allow you to store your photos (on its internal memory or externally), to preview your photos before printing them, and to have total control over the printing process (you will be able to choose the time and place to print your photos)! Above all, the manual mode will allow you not to waste photo paper! As a result, you will end up spending far less on replacement cartridges (which can be quite expensive if you are a real shutterbug). Fortunately, the paper used by the Instax Square is among the least expensive of any instant camera (this is true of Fujifilm cameras in general). The Instax Square SQ10 has its own photo paper format (available in black or in white). The SQ10 is a very comprehensive instant camera and is equipped with numerous shooting modes (such as a macro mode and a double exposure mode) in addition to having a number of visual effect filters (vignetting, luminosity) that can be applied to your photos before or after taking them! Since the Instax Square is in part a digital camera, a microSDHC card can be used to expand its internal storage memory (which is capable of storing up to 50 photos). The SQ10 also features a micro-USB port which can be used for charging the camera; basically, the SQ10 offers all the conveniences of a digital camera! What intrigues – and pleases me – about this camera is its 3-inch 460 000 points TFT color LCD display. While it is not a touchscreen, it is perfect for superimposing two photos when using the camera’s double exposure mode. What’s more, there is a small indicator on the display that lets you know how many photos you have remaining (so that you don’t keep shooting once you have run out of film!). As far as its photos are concerned, the SQ10 produces great-looking square format photos (6.2×6.2 cm) thanks to its 3-megapixel sensor! The Instax SQ10 is quite responsive and has a delay time of only 2 seconds between digital previews (during which time the camera verifies its range to target and automatically adjusts its focus) which is higher than the average for compact cameras, but much lower than the average for other instant cameras. The SQ10 also has a 15-second delay for recording and printing photos. In terms of its print quality, users have reported this camera’s photos to have deep blacks, bright colors, and somewhat blurry details. While not perfect, the SQ10’s high-quality photos are fairly precise and accurate in terms of their color rendition. It takes around 2 minutes for this camera’s photos to develop fully – a relatively short time compared to the average. The SQ10 is also able to print an assortment of either 4 or 9 different photos on the same sheet of photo paper – a really neat feature! Despite its few shortcomings, the Instax Square SQ10 is a very powerful and versatile hybrid camera! Lomography is another heavyweight in the analog film photography industry (originally serving the Soviet market). This company has come a long way since its beginnings by opening itself up to the international market which is why I have been able to include one of its beautiful cameras in this selection: the Lomo’instant Automat. What appeals to me about this camera is its purely vintage look and its red and white color scheme. Moreover, the Lomo’Instant Automat is fairly angular – like its predecessor the Lomo’Instant. 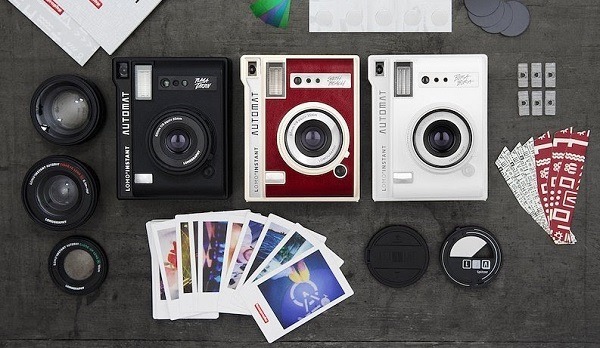 While both of these cameras are compatible with Fujifilm’s Instax Mini photo paper, the Automat is shorter and 5 cm wider than its predecessor. Another interesting thing about this camera is that it comes with an assortment of replacement lenses. It is possible to change the Automat’s lens in order to create different visual effects… close up, wide angle, fisheye (170-degree view)! It also features a lens cap that doubles as a remote control shutter release! 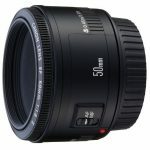 No other manufacturer offers such a comprehensive assortment of lenses – not even Fujifilm! You will, however, need to remember to set the camera’s focal distance to infinity before using any of these lenses, otherwise, you run the risk of being disappointed with your results. What bothers me the most about this distinctively designed camera is that it runs on (CR2) batteries; given its price, I really would have preferred that it incorporate a rechargeable battery – as other high-end (and some even less expensive) instant cameras do. Another disappointing thing about the Automat is that it does not have a mirror for taking selfies (even though its predecessor did). Fortunately, its shutter release button is well-situated, making it easy to use the Automat for taking both portrait and landscape shots. The Automat features a digital exposure counter (located on the top of the camera next to its photo ejection slot) that will inform you via LEDs how many shots you have remaining! This camera is entirely automatic and, although its automatic exposure control is not always perfect, it is still pretty good. When taking shots indoors, you will need to use the Automat’s flash, otherwise, you will end up with very dark, underexposed photos! The Lomo’Instant Automat’s shooting modes are very basic; it has a flash mode, a multi-exposure mode, an exposure correction mode, a bulb mode, an automatic mode accompanied by bulb mode as well as several color filters. While you will be able to extend the Automat’s exposure time, you will need to remain perfectly still when doing so in order to avoid blurry photos! On this camera, shutter release and photo ejection are almost instantaneous and according to users, the Automat’s picture quality is better than that of the Lomo’Instant (although its photos take longer to appear). You will need to keep in mind that in order to obtain properly exposed photos, you should always use the Automat’s flash unless you are shooting outdoors with good light. While the Lomo’Instant Automat is undeniably a very nice looking camera, personally, I find its features to be too basic for my taste, not to mention that its focusing system still has much room for improvement. Before digital cameras existed, there was already a technology (the instant camera, more commonly referred to as a “Polaroid” camera) that allowed you to instantaneously view your photos. In the last few years, there has been a resurgence of interest in this type of camera as much from amateurs as from professionals. Instant photography is artistic, immediate, and wonderfully spontaneous! While Polaroid stopped producing its Polacolor film in 2018, its competitors have not abandoned the instant photography market… Fujifilm, The Impossible Project (which bought Polaroid), Lomography and Kodak have all decided to revitalize this segment of the market by developing their own instant cameras with modern functionality. If you are interested in experimenting with this “spontaneous” form of photography, here are a few things you should consider before rushing out to the store. Traditionally, instant cameras have been criticized for having cheap plastic cases…however, things are beginning to change in this respect. Several manufacturers are now using more solid materials in the construction of their new devices, making them much more durable. When purchasing an instant camera, make sure that its case is made out of durable plastic in order to avoid unpleasant surprises. Most people want a camera with a retro design that is reminiscent of instant cameras during their heyday. Modern instant cameras are either entirely modern looking (such as the Kodak Printomatic) or combine modern elements with retro ones. Your choice will depend on your personal preferences; your instant camera will be a reflection of your creative vision so choose one that suits your personality! A flash is an essential component of any camera. It can help you take beautiful photos if used properly or ruin your shots if improperly used. Be sure that the camera you choose has a flash capable of varying its intensity and which, at the very least, can be deactivated. 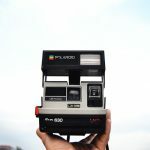 There are three different types of film available for instant cameras: the classic polacor film by The Impossible Project (Polaroid), Fujifilm’s Instax, and Polaroid Zink (which employs a thermal sublimation process). Every type of instant camera is designed around a specific type of film and vice-versa (however, on rare occasions, an instant camera will be able to use other types of film than the one it was designed for). The price of these different types of film is quite variable; they range from very affordable (Kodak products for example) to very expensive (Polaroid). This manufacturer’s films are available in four different formats: 600 pack, SX-70 pack, Image/Spectra pack and sheets of photo paper for large format cameras. These various films are primarily used in old instant cameras (with the exception of the I-1). Fujifilm’s Instax comes in two different sizes: Mini (86×54 mm, around the size of a business card) and Wide (99×62 mm). These two films can be used with Fujifilm Instax cameras as well as with Lomography Instant cameras, which is convenient. Polaroid’s Zink is the only instant film to rely on a digital printing process. While Polaroid’s camera takes photographs in a conventional way, those photos are printed on thermal sublimation paper via the camera’s built-in printer. The images produced by this process measure around 5×7.5 cm. The great thing about instant cameras is that their photos are developed directly on the same paper that they are printed on. As a general rule, this development process takes at least 5 minutes to complete and photos should, ideally, be left to develop resting in a dark and dry place (not any hotter or colder than 18 to 20 degrees centigrade). Shaking or blowing on a photo won’t make it develop any faster! Instant cameras are generally defined by their ease of use and by the simplicity of their settings. However, modern instant cameras tend to combine retro features with functionality worthy of a digital camera. For example, modern instant cameras can have a self-timer, a bulb mode, a double exposure mode, an exposure correction mode as well as many other modes (macro, party, etc.). The higher the product line – and consequently the higher the camera’s price – the more features it will have. Now that you know what to look for, it is time to choose your instant camera. Above all, remember to have fun! Previous Nikon D5500 vs. D5600 vs. D7200 vs. D3400, what’s the difference? Next Canon EOS M50 vs. EOS M100 vs. EOS M6/M5: What’s the difference? Should white balance setups be totally ignored in the taking of RAW photographs?